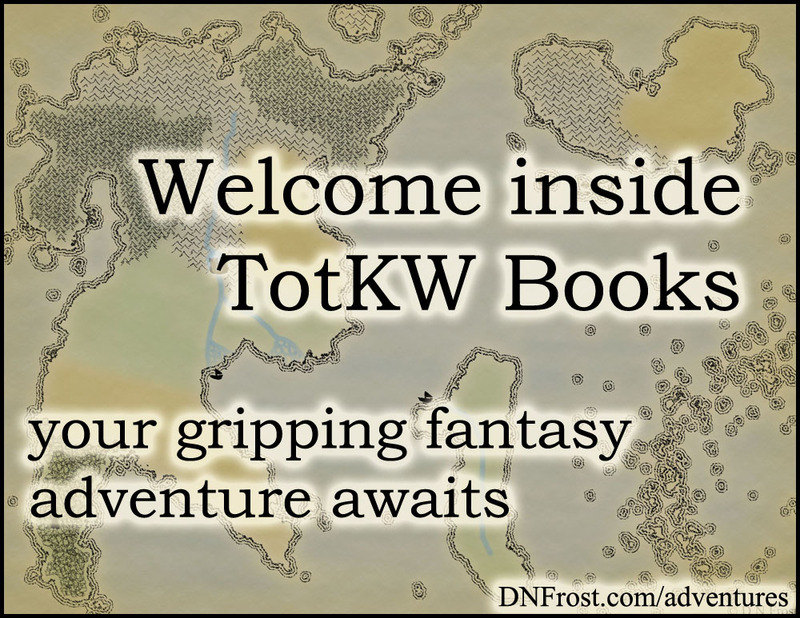 This post is Part 11 of a series to augment the Atlas of the Known World available for free download. Start with Part 1 here. Tropical paradise of plantations and aristocrats. You voted Kanata runner-up of January 2016 by 36%. 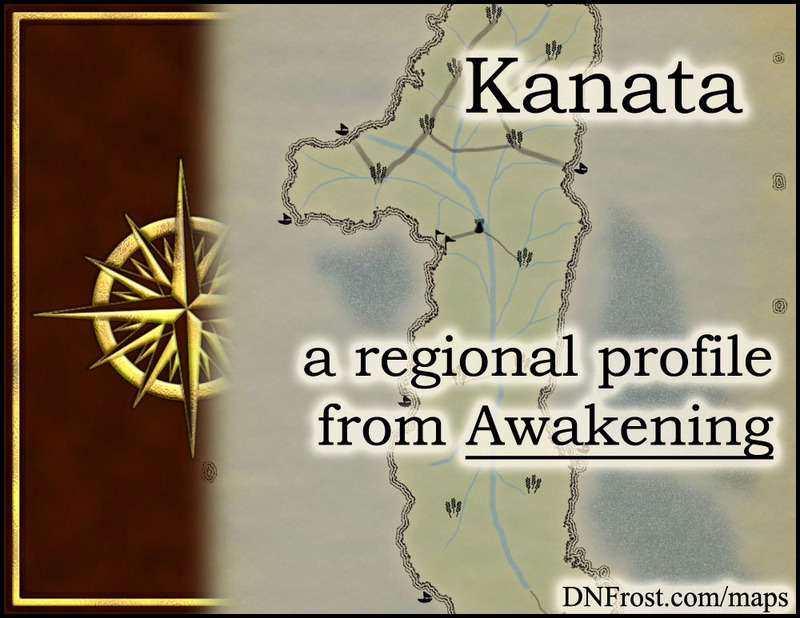 In Chapter 8 of Awakening, Kanata is a large plantation island at the southern edge of the Katei Ocean. It stretches along the eastern edge of the Gulf of Lohki, where warm ocean currents flow up from the Great South Sea. Cooler ocean currents circulate north and east of Kanata, marking the western limits of the Dohar archipelago. The heavy moisture in the air rains consistently on Kanata, making for long, wet growing seasons. This region also borders the Lohki Sea, and the merfolk reefs of Dynde and Juli. The only uncultivated soil in Kanata lies beneath her cities. A wealth of sugar cane grows for Kanata's many plantations, though rice paddies are not uncommon in low-lying areas. Further inland, some crops of plantains grow interspersed with the more profitable sugar cane. Aside from insects and insect-feeding birds, Kanata supports few wild animals, though some livestock are raised for dairy and labor. Prized racing dragons are also raised, supporting an elite entertainment and gambling industry. The sandy coasts of southeastern Kanata often see pods of sea wyverns come ashore to birth their pups in spring. The humans native to Kanata are tanned with light hair and eyes. Over time, Kanatans have elevated themselves from simple farmers to enterprising merchants and wealthy plantation owners, mostly through the exploitation of imported slaves. The slave population is far more diverse, encompassing human races from across the Known World, most notably Kholl and Dohar. While slaves dress in whatever clothing made available to them, native Kanatans dress in elaborate garments and bright colors. Radiant hues and rare dyes are prized as status symbols, and aristocratic women often dye their hair lurid shades of teal and violet for special occasions. Like all the human races, Kanatans rarely display the ability to wield elemental magics. They are considered the best Animal mages in the Known World, however, and Kanatans sometimes have noticeable abilities with the Gift, their latent special magic. While their sensory magics are somewhat weaker than other human races, Kanatans are notably balanced between Flavor magic, considered their prime sensory magic, and Light magic, which is generally latent in humans. This balance gives rise to a somewhat higher prevalence of rare sensory mages wielding Cuisine magic, which influences digestion and nourishment. Kanatans value wealth and commerce, and the Kanatan Parliament does little to regulate either. The 100 members of Parliament are appointed by the land-owning families of Kanata, with each family appointing one member per percent of total Kanatan land owned. Due to the education required, magic is considered an expensive hobby of the elite, and the bright colors of status are closely affiliated with magic power. Kanatan high society is rigorously structured and frangible, with costly social pitfalls lurking behind the most innocent of conversations. Families are patriarchal and land is usually handed down to the oldest son, without dividing land amongst children. Merchant families tend to incorporate all capable children in the family enterprise. While Kanatans use the standard calendar based off the solunar tables of the ancient merfolk, they do not celebrate their new year on the winter solstice. Instead, the autumnal equinox is considered the start of a new year, and the ceremonies often coincide with post-harvest celebrations. Kanatans measure their age in years, and sons of the aristocracy come of age either on their twentieth birthday or their graduation from school, whichever comes first. Aristocratic daughters become eligible for courtship on their sixteenth birthday, when they are introduced to society in grandiose debut galas advertising their new availability. Marriages are often arranged between the woman's suitor and her father, and they usually involve a significant exchange of wealth or property for the woman's hand. For the merchant class, debut galas are more understated and arranged marriages are less frequent, though engagements are often sealed by business partnerships or internships for new in-laws. As adults, men are expected to maintain their wealth and lifestyle for their families, and women are expected to mind the home and raise well-groomed children. An isolated island with a superior fleet of ships, Kanata has little need for more than local enforcement and slave overseers. However, most Kanatan ships are merchant vessels, and there is no official navy. Instead, merchant ships are expected to defend Kanata from the infrequent pirate raids along the northern and southeast shores. Merchant ships are far more likely to come under pirate attack in open waters than near land, and sailors often double as mercenaries, paid both a percentage of cargo profits and a reward per pirate slain. Though sailors form Kanata's main line of defense against pirates, they are disdained by the aristocracy and viewed as menial laborers just one step above slaves. Kanata's merchant class has more appreciation for their sailors, but they still view them as hired employees, often interchangeable and ultimately replaceable. Allanic is the language of commerce, and Kanatans have long since forgotten their ancestral language of Thone. While many merchants also speak some degree of Khollic, the lingua franca of Allanic is the native language of all Kanatans. It is written in the angular script of the Allanic Empire, but Kanatans have infused their speech with many more gesticulations than the mainland to the west. To a typical speaker of Allanic, the Kanatan dialect sounds quite rhythmic and lilting, with informal grammar and a predilection for omitting certain parts of speech, especially subjects and objects that are obvious in context. Kanatans often employ alternate spellings from mainland Allanic, and they prefer some terminology borrowed from the language of the mers, despite legitimate Allanic equivalents. 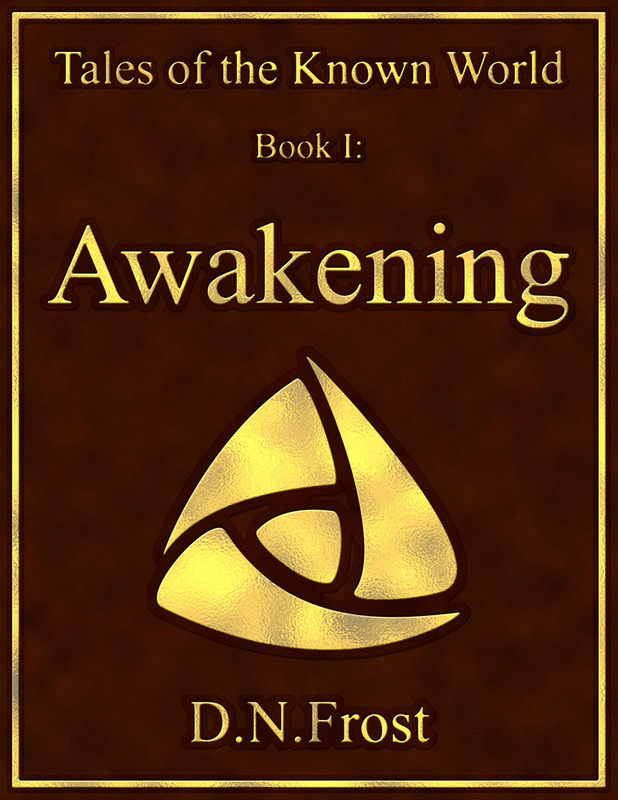 In the book Awakening, Anelle is the daughter of a Kanatan aristocrat, and she escaped an arranged marriage with the help of a ship's captain named Kigal. Together, they roamed the seas until one day a destructive wave forced them to dock in Port Myre for repairs. In the mayhem, Anelle and Kigal encounter the runaway slave Larin, who barters for passage to the free land of Allana. Once under way, Anelle and Kigal discover they are now embroiled in a deadly quest to fulfill an ancient prophesy before time runs out.